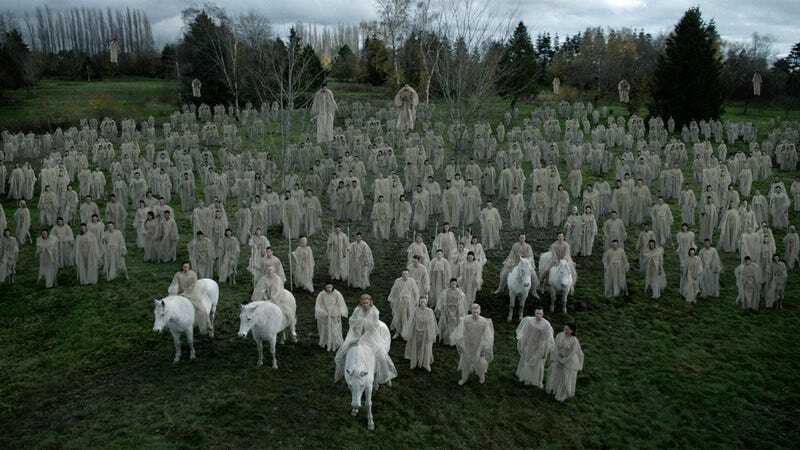 io9 sat down with some of the stars and producers of The Magicians to talk about what’s going on in season three of the Syfy series. Thanks to the gods cutting off humanity’s access to magic, the characters are going to spend a good amount of time apart this season. Quentin (Jason Ralph) and Julia (Stella Maeve) are trying to figure out how she still has magic, Alice (Olivia Dudley) is struggling with being human again, and Penny the Librarian (Arjun Gupta) is trying not to die. But, I’d say Eliot (Hale Appleman) and Margo (Summer Bishil) have the biggest crisis at hand. They’ll be dealing with a fairy occupation of Fillory that’s taken the king and queen out of power—but as Appleman told me, no one else actually knows about it. It’s the lack of magic and secret occupation that will force Eliot, in Appleman’s words, to “step up to the plate as a king,” with him and Margo taking on different missions to get their kingdom back under control. According to Appleman, Margo will stay behind to keep an eye on the fairies, while Eliot and Quentin will venture on the Muntjac, a living ship, to try and save the world. The producers wouldn’t tell me how long Eliot and Quentin are on the quest, which is presumably to find the series’ famed golden keys to unlock magic, but they did say it will take a good amount of time. There’s even an inside joke about it in the first episode. “They do consult an expert who theorizes it might take about a season,” executive producer Sera Gamble said. While Eliot and Quentin’s adventures on the high seas won’t likely take up the whole season, it does look like the show’s pacing is slowing down a bit overall in this upcoming chapter—something Appleman told me earlier this year was the main thing he wanted going into season three. The best part about this is that not only does this give them a chance to experiment with storytelling (including possibly another musical number! ), but there will also be more time spent on other characters, instead of just Quentin. The Magicians is set to return in January 2018.